The name Bombay associated for me with adventure. Probably because in the adolescence age I was fascinated by the novels about the pioneers, the seafarers, the pirates, mysterious lands. Bombay is a former name of Mumbai. It is the biggest port in India. Marine Gateway is a significant symbol of this place. 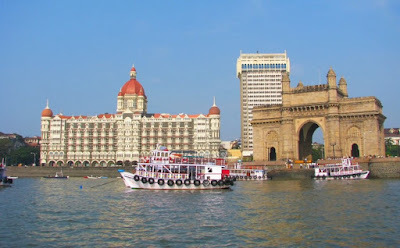 It was the first sightseeing in Mumbai which we discussed with Aishwarya. It is the first because this is what tourists see when they come to Mumbai by sea. Aishwarya lives in Mumbai and she praised this city for the very good management. We can see the gateway and a hotel on the picture. "Could you recommend me to stay in this hotel?" I asked Aishwarya. "Yes, of course", she answered. "If you want to spend all your money, you can stay in this 5 stars luxury hotel", she added. rickshaw car with three wheels for three passengers. The last one looks especially attractive. Additionally, it is a very cheap. They produced in India. 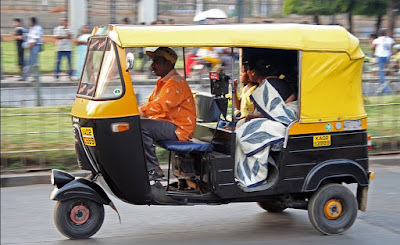 An auto rickshaw or a three-wheeler is a motorized development of the traditional cycle rickshaw. 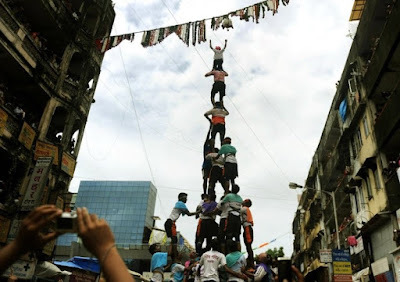 During Dahi Handi festival tourists can see a Human pyramid. This ceremony based on the event of stealing butter by Krishna in his childhood. People are trying to reach the high point for stealing butter. My last question for Aishwarya. "There are a lot of things to discuss, but what could you recommend to see in India for the short vacation?". "Goa and Mumbai" was the answer.